Good morning!! 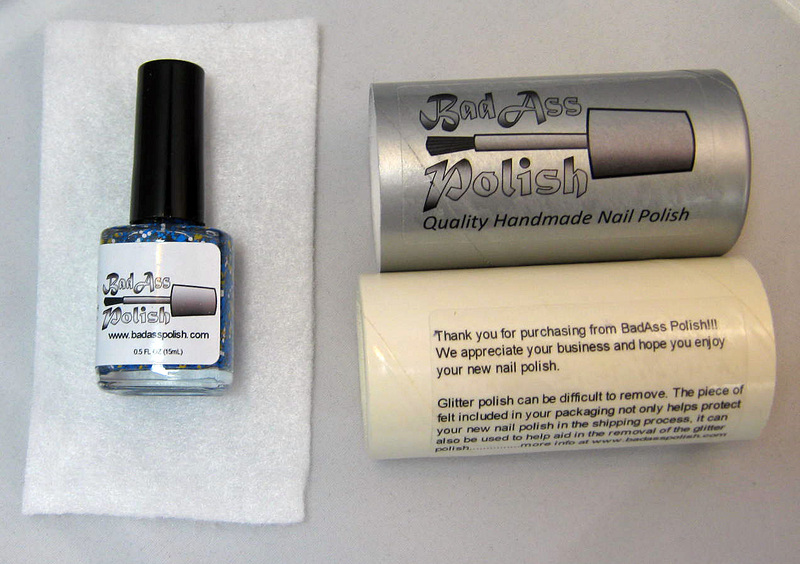 BadAss Polish is debuting their spring lineup including a highly appropriate baseball themed glitter. Allow me to introduce you to Brew Crew, named for BadAss's home state ball club, the Milwaukee Brewers. 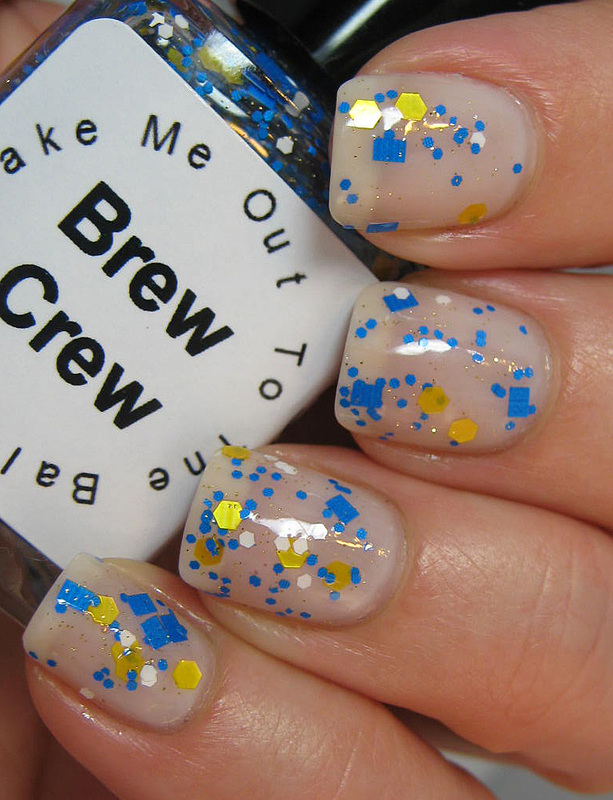 Brew Crew is a collection of matte glitters-- large yellow hexes, small cobalt blue and white hexes, and cobalt blue rectangles finished with a smattering of silver and gold shimmers, all suspended in a clear base. This glitter is pure fun. It's easy to get out of the bottle and onto the nail-- minimal fishing required. BadAss's formula has improved already with this second collection, which is kind of amazing because there wasn't much to complain about before. For a large glittered polish, this applies beautifully. I used one coat of Brew Crew over three coats OPI Don't Touch My Tutu!. The delicate, sheer white offsets the bright and cheerful glitters beautifully and makes this a fun riff on this spring's glitters in a milky white base trend. Two layers of topcoat smooth Brew Crew out nicely. If you're unfamiliar with BadAss Polish, their presentation and packaging is second to none. Each polish comes in these cute, sturdy little tubes lined with a piece of felt and instructions on using it for glitter removal. Brew Crew will be available for purchase March 13 (tomorrow!) for $8.75 + shipping at BadAss Polish's etsy shop here. Stay completely up to date with new releases and like BadAss Polish on facebook here. Check out BadAss swatches and reviews on the main webpage here. Follow creator Amy's blog here. Some product(s) used in this post were sent for review. I love this color, it looks so great on your nails! 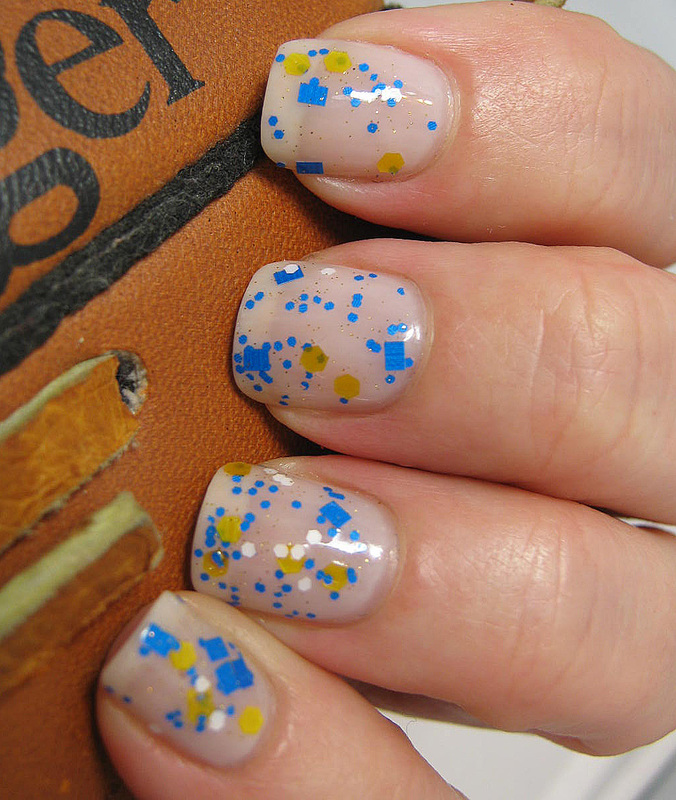 And baseball themed polishes - heck yes! I love their packaging, never seen an Indie Polish have that! Ok I have to say I really like the glitter but my favorite part of this manicure was layering it over a french base. Seriously I'm so in love with this whole look! But of course! :D You need this, Maggie :) Did I say that already? What beautiful swatches. You are good....REALLY good. I love the one with the glove too - nice touch. As I said before, Amy is so lucky to have you review her polishes. 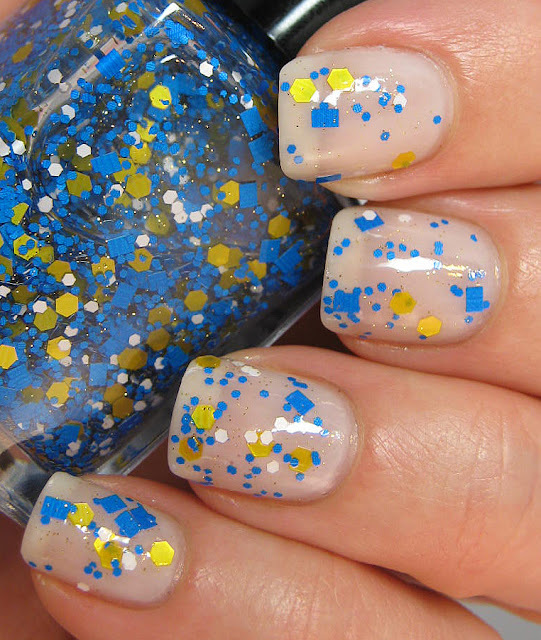 What a great springy or summery polish! Love the blue/yellow/white combo-- one of my faves, and I also like how you've layered it over a neutral cream (color) base. Looks great! It is a cheerful glitter :) It'll be fun to layer it over some brighter cremes once summer rolls around. I just love that they send a piece of felt with each polish! And this one is gorgeous, too! It's the 1st time I see this polish but oh my! It's gorgeous!! I love matte those blue and yellow glitters together! Amy did a great job on this one, for sure :) I'm glad you like! Dude, that would be one cool looking polish.